NEW YORK (July 17, 2018) – FlightSafety International has been selected by Delta Air Lines, Inc. to provide flight training to the company’s employees through the Delta Propel Pilot Career Path Program. The employees selected by Delta to participate in the Propel program will earn FAA multi-engine commercial instrument ratings and become qualified as a Certified Flight Instructor at FlightSafety Academy. 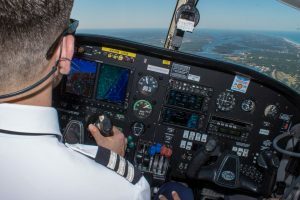 They will then be offered an opportunity to work at the Academy as an instructor while they build the 1,500 hours needed to meet FAA requirements to hold an Airline Transport Pilot certificate. Upon completion, they will fly for an approved Delta Connection carrier and then transition to Delta Air Lines in 42 months or less. FlightSafety Academy offers a wide variety of programs tailored to the specific needs of domestic and international airlines, corporate flight departments, government and military agencies, other flight training organizations, and individuals with no prior flight experience. The Academy’s fleet of over 100 aircraft includes Piper Warriors, Piper Arrows and Piper Seminoles that are equipped with Garmin G500/650 series avionics, NextGen ADS-B In and Out, and iPad compatibility. The aircraft are maintained to the highest standards and exceed FAA maintenance inspection requirements. Students fly out of an ATC controlled airport with instrument approaches under an airline style dispatch operation. The 30-acre campus is equipped with a full array of training tools including multi-media classrooms, flight training devices, and an Air Traffic Control communications lab. The Academy has accommodations for more than 500 students, a comprehensive library, pilot shop, and other amenities typical of a university. FlightSafety International is the world’s premier professional aviation training company and supplier of flight simulators, visual systems and displays to commercial, government and military organizations. The company provides more than 1.4 million hours of training each year to pilots, technicians and other aviation professionals from 167 countries and independent territories. FlightSafety operates the world’s largest fleet of advanced full-flight simulators at Learning Centers and training locations in the United States, Australia, Brazil, Canada, China, France, Hong Kong, India, Japan, the Netherlands, Norway, South Africa and the United Kingdom.